class submarine, departed Freemantle, Australia bound for her patrol area in the South China Sea east of Saigon. This was her second war patrol and would be her last. At 22:00 hrs on the night of August 13, 1944 while in the Balabac Strait an explosion rocked the boat. Those on the bridge were thrown off their feet and some were injured including the commanding officer, Cdr. Crowley. The bridge was soon covered in oil and other debris, below the screams of men and the rush of escaping air could clearly be heard. Nobody could get below to determine the exact cause of the explosion due to the air being forced out of the boat, but it is thought she struck a mine. With the Flier still running at about 15 knots the end came quickly, less than a minute after the explosion the Flier went under for the last time taking with her 71 submariners, fifteen men made it out off the boat and into the sea. Those who were still alive now began the fight to stay alive. Several of those in the water were injured and everyone was covered in diesel fuel. Soon a call was made to gather all survivors together. Lt. William Reynolds and Edgar Hudson, who were both wounded and Charles Pope, who were all reported as in the water, never made it to the group and were never seen again. Ens. Philip Mayer was unconscious and had to be let go, he also was lost. A decision had to be made and Cdr. Crowley weighed his options and decided to make for the islands to the northwest rather than Comiran Island because the possibility of being captured by the Japanese was greater there. Shortly after this Lt. Paul Knapp drifted away from the group, he was never seen again. Making their way was difficult at best, the sky was overcast and the only way they could get a bearing on their direction was from lightning which would flash occasionally. By 04:00 Aug. 14 Lt. John Casey could not keep up and was lost to the sea. It was now realized it was every man for himself. Cdr. Crowley told the others that they had to make the best possible speed for land. Soon after this Gerald Madeo fell behind and was lost. Russo and Tremain were also separated from the group leaving Crowley, Liddell, Jacobson, Howell and Baumgart the only men left in the group. Soon the group of survivors found a floating palm tree and used it to help them get to shore. They arrived on Mantangule Island at about 15:30 on Aug. 14. To everyones surprise Russo was already on the island, he had made the swim by himself. Another welcome surprise came when Lt. Liddell found Tremain alive on the eastern side of the island sometime after 17:00, but this would be the last surprise. They were alive but stranded on a small island and on their own. Nobody was looking for them because nobody knew they were lost. Soon the decision was made to make a raft and island hop until they could get to Palawan Island, there they could contact a coast watcher and make arrangements for rescue. This they did and it took until Aug. 19 to find a native who knew where there was a coast watcher station. Contact was finally made and arrangements to pick them up were set for Aug. 31. 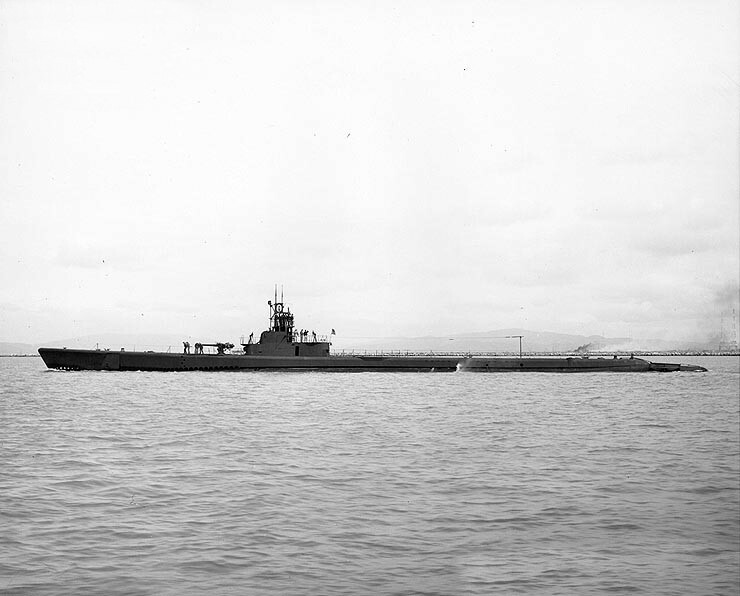 The last event came when a Japanese merchant ship anchored near the rendezvous area, however they maneuvered around it undetected and boarded USS Redfin SS-272 and headed to safety. As they headed back I am sure the thoughts of their crew mates who did not make it back came to their minds and probably remained there forever.